Immunogen: Purified human vitronectin from plasma by heparin-affinity chromatography. Application Notes: Detects bands of ~75kDa and 65kDa by Western blot. Scientific Background: Vitronectin is a plasma glycoprotein that circulates in the blood as a mixture of both 75kDa and 65kDa forms. Vitronectin is a major cell adhesive glycoprotein, and a common component of extracellular matrix and plasma. It competes effectively with other plasma proteins, and often participates in cell attachment, regulation of blood coagulation and immune responses. It has similar tissue distribution to fibronectin, which is recognized by its integrin receptor. 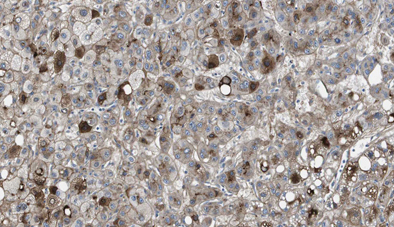 Figure: Immunohistochemical analysis of cancerous liver tissue stained with Vitronectin (human), mAb (HV2).